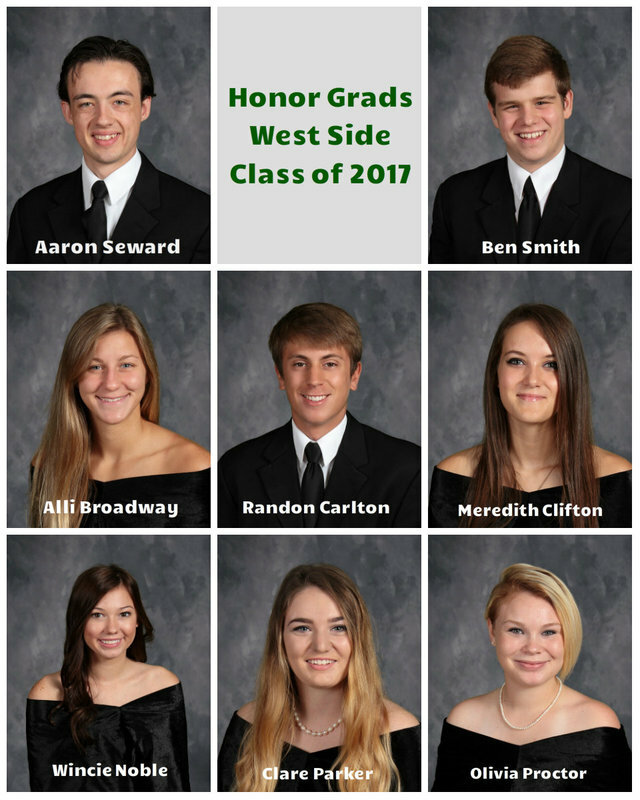 Aaron Seward has been named Valedictorian, and Ben Smith has been named Salutatorian of the West Side High School Class of 2017. Mr. Seward, son of Pam Rousseau and John Seward, finishes high school with a cumulative 4.125 grade-point average. Mr. Smith, son of Debbie and Ken Smith, finishes high school with a cumulative 4.03 grade-point average. Both students took Advanced Placement courses that enhanced their GPA. Honor Graduates must earn a minimum 3.5 GPA and take either AP or college-level coursework; the top two are recognized as valedictorian and salutatorian. Remaining Honor Graduates in the class are Alli Broadway, daughter of Tammy and Allen Broadway; Randon Carlton, son of Gina and Boyd Carlton; Meredith Clifton, daughter of Melissa and John Clifton; Wincie Noble, daughter of Jamie and Terry Tucker; Clare Parker, Patricia and Gordon Parker; and Olivia Proctor, daughter of April Ann Proctor. The public is invited to commencement at 7 p.m. Friday, May 19, at Brady-Hipp Arena.